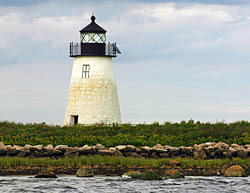 Constructed in 1819, Bird Island Light is located on a small island due south of Butlers Point in Marion, at the east entrance to Sippican Harbor. Originally attached to a stone dwelling, the 31-foot tall stone tower is the only extant structure on the 2-acre island. The construction of the Cape Cod Canal led to increased traffic in Buzzard's Bay, but lighted buoys along the main shipping channel eliminated the need for Bird Island Light and it was deactivated in 1933. The dwelling and other outbuildings were destroyed during a hurricane in 1938. After declaring the island as surplus property, the Federal government sold it to a private party. The town of Marion has owned the island since 1966. The tower was restored by the town and the Sippican Historical Society in 1976. Formed in 1994, the Bird Island Preservation Society raised funds to further restore the tower. A modern, solar-powered optic was installed atop the tower in 1997 and Bird Island Light was relit as a private aid to navigation. The island is covered with low scrub and rocks and serves as a nesting ground for endangered Roseate terns from May through August. 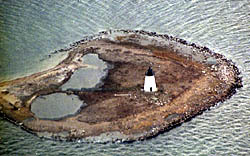 Bird Island Light is located on Bird Island in Sippican Harbor near Marion. It is owned by the town of Marion and maintained by the Sippican Historical Society. The island and light station are closed to the public. Bird Island can be viewed distantly from shore, but it is best viewed by boat. For further information call 508-748-0550 or visit the Bird Island Light Preservation Society website.